Dien Bien is mountainous tropical area. There are the dry and the rainy seasons. The average temperature is about 21 - 23oC. Dien Bien possesses charming natural scenery such as Pa Khoang Reservoir, Tham Bang Cave, Ban Phu Citadel, museum of Dien Bien Phu Victory. Dien Bien is also proud of many historic sites: Noong Nhai Vestige, Muong Phang Forest, especially, Dien Bien Phu Vestige with a global well-known victory in 1954. 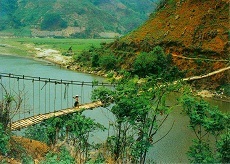 The network of road is convenient include:- It takes 478km from Hanoi following National Highway No. 6 to Tuan Giao and then the 279 to Dien Bien Phu.- It is 195km from Dien Bien Phu to Ma Lu Thang border gate (Lai Chau) following National Highway No. 12.- The National Highway No. 279 links Tuan Giao to Tay Trang border gate vise Dien Bien Phu. Beside that, there is Muong Thanh Airport in Dien Bien Phu, connecting Ha Noi - Dien Bien Phu.